Haemanthus albiflos is a flowering plant native to South Africa and Namibia. A member of the family Amaryllidaceae, it is an evergreen bulbous perennial with unusual flowers that give it the common name of paintbrush. Tolerance for indirect sunlight and neglect has made this a popular houseplant in countries where it would not survive the winter climate. 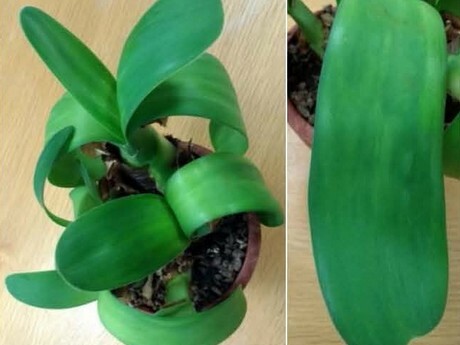 One such house plant bought at a UK nursery in the late 1990's, was later recognised as showing mild streaking symptoms consistent with a virus infection (Fig. 1). The authors can find no record of viruses associated with Haemanthus albiflos but the related plant Haemanthus multiflorus (blood lily) recently removed from the Haemanthus genus and renamed Scadoxus multiflorus, is a host for Nerine latent virus (NeLV) (Chen et al., 2016). From accessions on the NCBI database blood lily is also recorded as a host plant for Cucumber mosaic virus (CMV) and Tomato spotted wilt virus (TSWV). Figure 1: Haemanthus albiflos with mild streaking symptoms. The haemanthus plant was investigated using immuno-strips (Agdia) to detect CMV, Impatiens necrotic spot virus, Iris yellow spot virus and TSWV but no antibody reactions occurred. This was followed by total RNA extraction from leaves (Plant RNeasy kit, Qiagen) and RT-PCR with generic primers that amplify viruses from the Carlavirus (Nie et al., 2008) and Potexvirus genera (van der Vlugt & Berendsen, 2002) and the Potyviridae family (Gibbs & Mackenzie, 1997). The testing indicated a positive result with the carlavirus primer set Car-F2b and oligo-dT. The sequenced PCR product when compared to the NCBI database, indicated a close match with Nerine latent virus (NeLV), also known as Narcissus symptomless virus. To further characterise this isolate, the complete coat protein (CP) was amplified (Genbank Accession No. MK085064) using specific primers either side of the CP region (NeLV6946F 5'-AGAGTTTAGTGTCCTCTTAGGTTTA-3ˈ, NeLV8018R 5'-AAGGAGCCACACTTGATTGTCTT-3'). Sequence alignments, with available NeLV CP sequences (NCBI database), showed that the virus isolates shared high identity with each other, 95-98% at the nucleotide level. The highest identity of 98% was with JX524884 from narcissus (Taiwan) and HM119498 from nerine (Netherlands). The alignments revealed the haemanthus isolate had three nucleotides (one amino acid) less than other NeLV isolates and this deletion was located near the five prime end of the CP. The phylogenetic relationship of the NeLV CPs from different host plants and countries of origin are shown in Figure 2. 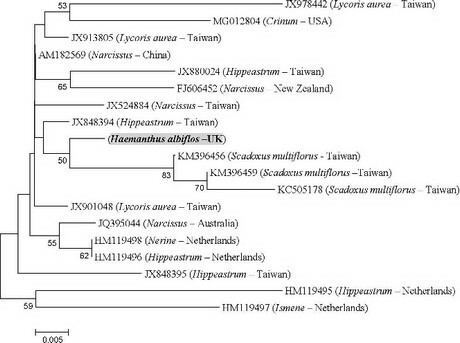 Figure 2: Phylogenetic tree of nerine latent virus coat proteins from different geographical locations and plant species. All are full length nucleotide sequences except Genbank Accession No. FJ606452. The phylogenetic tree was generated with the MEGA5 programme using the neighbour-joining method with replicas bootstrapped to 1000. (Note: Scadoxus multiflorus was previously known as Haemanthus multiflorus). NeLV is reported as symptomless in the blood lily plant (Chen et al., 2016) and previously in the host species of Nerine bowdenii and Hippeastrum hybridum (Brunt et al., 1996) but mosaic symptoms have been reported in Crinum plants (Jordan et al., 2018). The symptoms produced by NeLV on indicator plants have been recorded (Brunt et al., 1996): local chlorotic lesions with Chenopodium murale and C. quinoa with systemic infection only reported for Nicotiana clevelandii; whilst N. benthamiana and N. tabacum were reported as insusceptible. To confirm this report and assess if a second virus may be present in the haemanthus, two each of the previously mentioned indicator plants were inoculated with ground leaf sap, diluted in water. Clear chlorotic symptoms were visible on the C. quinoa inoculated leaves from six days post inoculation (dpi), whereas symptoms on the other plants were either not present or not clear and could be mistaken for inoculation damage (Fig. 3). No systemic symptoms were seen. Subsequent RT-PCR with specific NeLV primers performed 14 dpi on the inoculated leaves found that only the N. clevelandii gave a strong product. N. clevelandii had shown no clear symptoms but the PCR results indicated replication and systemic movement of this virus that had not occurred in the other indicator plants. Whilst the testing was not exhaustive, the PCR, immuno- and bio-assays gave no indication that a second virus was present in the haemanthus plant and the observed symptoms are probably caused by NeLV. This report represents the first finding of NeLV in H. albiflos.